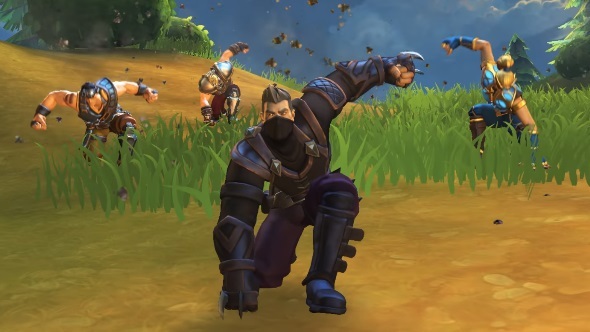 Our Realm Royale Assassin class guide will run you through all of the class’s abilities, builds, legendary weapon, and some tips to get ahead as the shadow based Assassin! We’re very early in the life cycle of Realm Royale, but early on the Assassin class is one of my favorites. It remains to be seen how it changes and evolves as we get deeper into the game’s development. For now, check out our guide below that should walk you through all you need to know about the class. Assassin gains 10% groundspeed as their passive. This means you can run slightly faster than every other class! The Assassin’s abilities are mostly about stealth and movement. Blink: Teleport forward a short distance. Can be used offensively. Fire once, blink towards and behind them to avoid return fire, and then turn around and fire again! Concussion Bomb: A bomb that knocks back yourself and (text cutoff). You can use this to knock yourself forward or back. You can also use this to push away an enemy who is close to you. It deals a slight bit of damage to enemies. Ghost Walk: Become untargetable and move 20% faster. Great to get away from your enemies or in a pinch push forward to be aggressive. Sensor Drone: Deploy a drone that reveals enemies for 5s. You can actually throw this pretty far so it’s nice to get an idea if anyone is around. Great for throwing into a Forge if it isn’t obvious someone is already in there. Smoke Screen: Throw a smoke screen that blocks vision and (text cutoff). Concussion Bomb is really good for comboing with your Legendary sniper rifle. You can knock someone in the air in a predictable arc and then take a shot at them with your sniper. If you get good at this, you can pretty consistently get guaranteed big hits of damage. If you are looking for the ability to get in and out of bad situations then this might be the build for you. Ghost Walk is a great skill for escaping and buying a bit of time, and Smoke Screen can give you a bit of temporary cover. Sniper Rifle: 1 Shot, 1,200 Damage, 1.0 Shot per second. The Sniper Rifle is a great Legendary weapon! It has a bit of bullet lag, but overall the shots arrive at their target pretty fast. If you land a critical hit with this thing, it’s usually lights out for whoever you hit. What’s crazy about this weapon is that it’s surprisingly accurate when not scoping. If you are in a close range fight, it’s worth taking a shot with this and then switching to your secondary weapon. Landing a 1,200 damage shot is going to put you in a great position to finish anyone who stands in your way! Like with most sniper styled guns that have bullet lag, you will want to lead any shots you are taking on further away targets that are moving. You don’t have to worry about drop, it appears like the shots go straight and don’t dip downward. Your best bet when using this, however, is to stay hidden and wait for your opponent to stop moving. Always look for the headshot, and get them into chicken form as quickly as possible! Here are some general tips that should help you get better with the Assassin class. Blink is an interesting movement ability. It doesn’t have the range of the Warrior or Mage class, but it can be used to dive through enemies and confuse them. A good way to do this is to take a shot at them, blink through them, and then turn around to shoot again. You are hoping they miss their shot on you while you are lining up a follow up shot! You can blink upwards if you want to get to a higher ledge! You can also blink through windows to exit buildings! Concussion Bomb can be great for knocking away a target and putting them on a predictable path. This works great for lining up a shot with your legendary weapon! If you are familiar with the Impulse Grenade in Fortnite then you’ll understand the Concussion Bomb. Use it to boost yourself forward for exciting plays.